The roots harmony vocals trio the Abyssinians was formed in 1968 by founding members Donald Manning, Bernard Collins and Linford Manning. It was in 1969 with their release "Satta Massagana" recorded on Coxson Dodd"s Studio One label - a Rastafarian hymn based on the Ethiopian Amharic language, that launched them into the ranks of Reggae music greats. "Satta Massagana" became one of reggae"s most popular songs; becoming an anthem that was heard on the radios, in the dancehalls and in the churches of Jamaica. It was also covered by many other International artists" including Third World. What followed were a string of hits of which included "Declaration of Rights," "Yi Mas Gan." and "Let My Days Be Long". Early albums were a collection of singles recorded throughout the 1970"s on their own label - Clinch, of which included "Forward On To Zion" (1976) and "ARISE" (1978). The group separated in 1980, during the separation group co-founder Donald Manning performed internationally under the name The Abyssinians with his brother Carlton Manning (of Carlton & The Shoes) and singer David Morrison. In Jamaica, Bernard Collins performed on stage with longtime associate George Henry... In 1989, Donald, Bernard and Linford joined together again to record over the next three years. These sessions resulted as the originally released album, "$19.95 + TAX" in 1995 with a very limited number of CD"s printed. Artists Only! Records realized the importance of this album and in 1998 re-titled and re-released this album as "REUNION". "REUNION" now stands strong as one of The Abyssinians greatest albums. In 2004, Donald Manning & Bernard Collins reunited on stage for the first time in over ten years along with singer David Morrison, performing on tour across Europe in the winter, at Colorado"s Reggae on the Rocks in the summer, and in December on a two week tour along the California coast . In February and March of 2005 they returned for an extended tour of Europe, and during the Summer of 2005 they toured the West Coast throughout California, Oregon and the Rocky Mountains in Montana, Utah, and Colorado. During the Summer they also performed at The 12th Annual Sierra Nevada World Music Festival, The 10th Annual Monterey Bay Reggae Festival and The 4th Annual Soul Rebel Festival. Until Heartbeat Records reissued Satta Massagana (a.k.a. Forward Onto Zion) in 1993, few groups in reggae were more of an enigma than the Abyssinians. "Satta Massagana," has been referred to as "reggae"s national anthem." 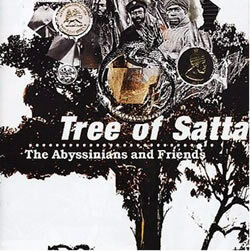 The recording session that yielded "Satta" was arranged and financed independently and clearly marked a turning point for reggae - lyrically, rhythmically, and spiritually. Donald Manning explains how the song was born. "Carlton [Manning] wrote "Happy Land" [b-side to "Love Me Forever"] with lyrics, "There is a land far, far away, where there"s no night, there"s only day. Look into the book of life, and you will see that there"s a land far, far away. "Satta Massagana" (meaning "give thanks") is obviously notable for its use of Amharic, the language of Ethiopia (Abyssinia). The Amharic is a result of Donald Manning"s Rastafarian influence on the group. The study of Amharic in Kingston in the 60s was a function of the post-colonial, Pan-African identity and Rastafarian awareness sweeping the ghetto after Haile Selassie"s 1966 visit to the island. Collins recalls how Donald"s brother Neville used to teach Amharic in the Jonestown area of Kingston. "[He] was a man who used to... have classes around there, where we could all go and learn the language, cause he used to get books from Ethiopia through England  Ethiopian opinions. And those books contain all literatures that we need. That"s how come we get acquainted with the Amharic... Bredren from all about used to come there and learn. Donald Manning explains the Amharic in some of the group"s well-known compositions. "Tena Yi Stillin. Dina Igzhabhier Y Mas Gan. Satta Massagana." When I say "Dina" means "good," "Igzhabier" means "God," "Y Mas Gan," [means] "he may be praised," so I correct the mistake that I made by singing "Satta Massagana" [to God]. "Tena Yi Stillin" means "greetings." It means "good morning." It means "good bye." It means "good afternoon." It means "health, may He give for thee.